It’s taken some time, but the academic side of higher education, along with an attendant philosophy of open, shared knowledge, are finally asserting themselves in digital learning at universities throughout the country. 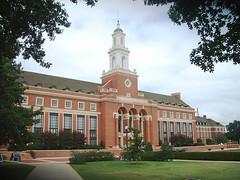 An open, elearning system is remarkably good news for Oklahoma, with its low college graduation rate and overall underfunded educational systems, just as long as higher education leaders here recognize that MOOCs and the soon-to-be launched DPLA are opportunities, not threats to their individual turfs. Massive Open Source Online Courses (MOOCs) and the Digital Public Library of America (DPLA), which launches April 18, represent a turn away from the corporate model of education and places professors and teaching, and, of course, students, at the forefront of elearning. Corporate learning management systems, from Blackboard to Desire2Learn, have for too long dictated the terms of online intellectual engagement at universities, especially smaller, non-research colleges with limited funding. Online, for-profit colleges can never duplicate in any sustainable sense the academic rigor offered by our public and private universities, especially our leading institutions of knowledge. Before I go further, let me give some background. MOOCs, which came into the academic scene a couple of years ago, are free online courses offered by some of the country’s premiere universities, such as Harvard and MIT. Anyone with an email address can take courses-“Epidemiology: The Basic Science of Public Health,” “Write Like Mozart: An Introduction To Classical Music Composition,” and “Greek and Roman Mythology” to name just a few– through systems such as Coursera and edX. The courses are not currently offered for credit, but that could soon change. The Digital Public Library of America is a project began in 2010 that aims, according to one of DPLA’s founders, Harvard professor Robert Darnton, to “make the holdings of America’s research libraries, archives, and museums available to all Americans-and eventually to everyone in the world-online and free of charge.” It will launch April 18 in an initial, limited form. The plan is to build the DPLA into what would be the largest bank of accessible knowledge ever in the history of mankind. The scope of the project simply can’t be understated. Can you imagine having every written artifact in history and much more available to you in a matter of seconds? It will revolutionize information science, and could help universities save millions of dollars (maybe even more) through centralization. The dilemma, of course, is the question over how are we going to pay for all this, and the answer is that we can’t afford to NOT go forward. Again, it’s difficult not to place it in sweeping terms. Our very existence on this planet may well depend on the main philosophy driving MOOCs and the DPLA. That doesn’t pay a professor’s salary, of course, but just as media outlets have had to adjust to the reality of the Internet so, too, must universities. I may risk ridicule here, but the money issue seems trivial when compared to the overall conception of what MOOCs and the DPLA offer mankind. In practical terms, MOOCs could be offered for credit in the days ahead and a combination of taxpayer and institutional money could be used to subsidize online education to underserved populations throughout the world. The DPLA, funded now by foundations, has many different partners and stakeholders, and could conceivably survive financially under its current, fiscal model. As I stated before, what I find so encouraging about MOOCs and the DPLA is the new surge of academic energy in online learning. I’ve taught online courses for some ten years now, and I’ve seen how corporate learning management systems have influenced pedagogy and class structure with mixed results. MOOCs are built around the professor; it’s not the professor building a course within a for-profit platform that will always increase in cost and will always have built-it obstacles to limit sharing or changing systems. MOOCs reassert the simple premise that it’s the instructor that determines course quality, not the technology itself, not a mid-level university administrator often without academic experience. It’s the instructor’s expertise, her credentials, her commitment that matters, not the underlying computer code, which in the case of MOOCs is open source and available to everyone. This is not to say that corporations don’t or can’t have a role in both MOOCs and the DPLA, but openness and sharing, their driving force, are the antithesis of monopoly and control. What does all this mean for our state? The concepts of MOOC’s and the DPLA represent a huge opportunity for Oklahoma. It’s been my experience that online learning here overall has been somewhat slow to develop and hindered by limited funding, institutional bias and lack of foresight. For example, the former provost at Oklahoma State University, Robert Sternberg, now the president of the University of Wyoming, recently made it a point to argue that online learning had limitations. But these new trends in online learning could open the door for thousands of Oklahomans, who want a college degree but face life obstacles in attending a college as traditional students. The state has chronically lagged behind the national average in the number of its college graduates. MOOCs and the DPLA also have the capability, if managed appropriately, to help make a dent in the nation’s student-debt problem if courses remain free or reasonably priced while allowing students to take courses with some of the best professors in the country and in our state. The new trends in online learning also open new opportunities for collaboration among our state’s many universities.